To become a faster sprinter you have to learn how to swim at 100% effort. It may be a cliché and it may seem obvious but think about what 100% really is. It is truly being explosive and putting every fibre of your body into an effort. It is not easy to do over and over. As a coach I like to motivate my swimmers by asking them if they were swimming as fast as they could and also ask: “Would you have swum faster if you were chased by a shark?”. To get them truly putting in an honest 100% effort I like to tell them the story of when I was chased by a shark. I don’t recommend going out into the surf just because if someone named Eddie. Because everyone knows; Eddie Would Go. When I was a swimmer we trained at amazing places around the world. One place that we went to a few times was the Gold Coast of eastern Australia. There I learned the true meaning of 100% effort by getting chased by a shark. In Australia there are surf lifesaving clubs along the coast and quite a few along the gold coast. Most are predominantly near larger populations but some started because so many people began surfing on a good beach. Tugun is a tiny suburb in Queensland south of Brisbane and Surfers Paradise, The Tugun Surf Lifesaving Club dorms overlook a great beach with regular good surf and that is where we were staying. At a long course pool close by we could swim with the local coach, a famous Aussie who mentored some of Australia’s best known swimmers including Olympic gold medallists Jon Sieben and Duncan Armstrong. We could cycle to the pool, get a thrashing by coach Laurie Lawrence, learning the joys of lactate acid and then cycle back. Once back at the surf club we’d quickly inhale a mountain of food and step out onto the beach! 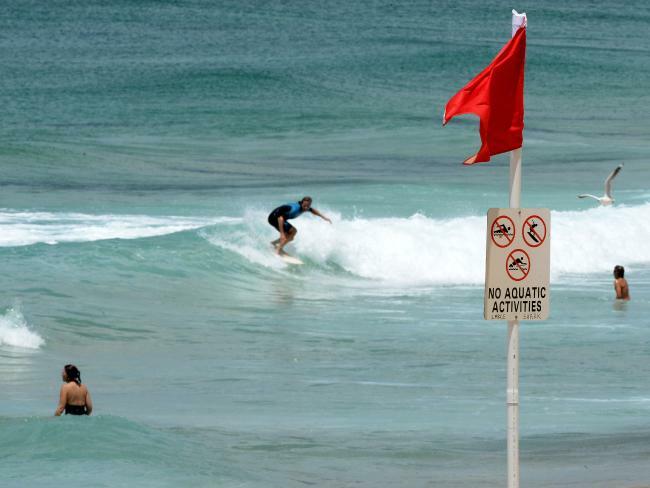 Lifeguards mark the beach ‘SAFE’ by hoisting two red & yellow flags. Public are welcome to swim within these flags. Some beaches have ‘shark nets’ following a large curve far out to sea keeping sharks away. Occasionally some get in. 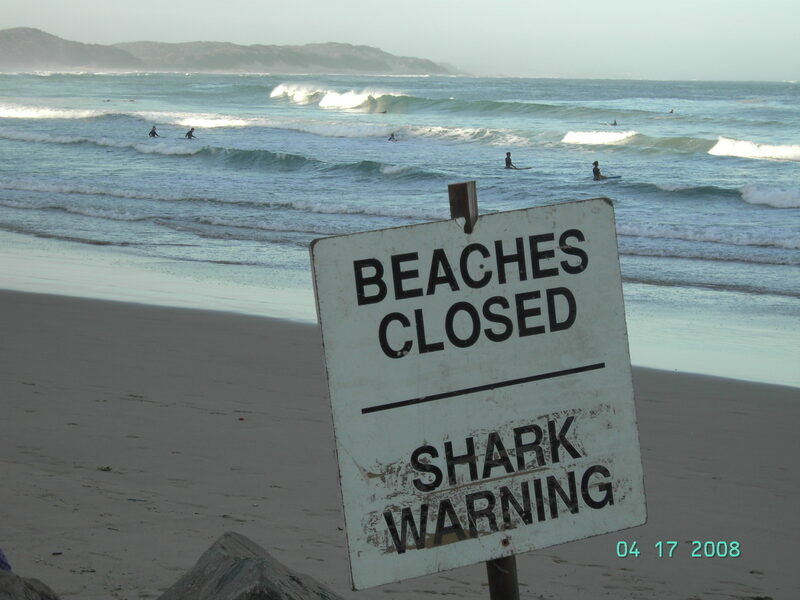 On days when there are sharks seen, or if the surf is too big, of it there is some other reason to close the beach, they put up this flag and ring a bell. On this particular day, the surf was perfect. Loads of people were on the beach or out in the waves. The lifeguards had their flags up and we were quickly into the surf! My team mate Darren Ward and I were using our kickboards as body boards. We played a game riding down the waves and bump each other along the way as we surfed. Great fun; sun, sand, sea …and bikinis. With our flippers on we could catch the waves easily if they were breaking where we waited. The trick was to get the wave in your ‘turn’ or loose rank in the ‘hierarchy of the waves’. With loads of people catching waves on this perfect surf-day it wasn’t too easy to get a ride. Then a bell rang. A proper clanging bell like the ones you heard for your bell lap in the 800 or 1500. We said to each other; “Was that the lunch bell?” we nodded agreement and I said; “Lets keep going, we don’t need to be back yet”. So we continued but missed a few good big waves. We were out pretty far to stay away from the proper surfers and if the wave wasn’t quite cresting it was harder to catch. For the really big waves you had to wait a bit longer for a good set and be out a bit further. Then we noticed there weren’t very many people around. In fact we were on our own. On the crest of the next wave we looked towards the shore and everyone was on the beach waving their arms above their heads…at us! Then we both looked at each other in realization; that was not the lunch bell, it was the shark bell. I don’t know if this guy knows the shark is there but I did. He might considering SPRINTING! The next wave was coming and I was looking down into the water. I didn’t have my goggles with me, which is unusual because I basically lived most of my life with goggles on, but I could look down into the water from the surface. I saw the black shape of a shark moving below us. Seconds later the next wave rose up behind us and we kicked like our lives depended on it. Cresting or not we both were on the next wave! Once we were riding down the wave we shot towards shore. It never felt so good to be on a wave. We rode the wave right up onto the beach. The sun-bleached blonde tanned lifeguard watched us trot up the beach with our flippers and kickboards, shook his head and said “Oi, you’re almost shark-bate mate”. That was swimming at 100% and how to swim as fast as a shark. This entry was posted in General Knowledge on swimming and tagged #coach, 100% effort, body surfing, Coaching, darren ward, Duncan Armstrong, jon sieben, Laurie Lawrence, motivation, principle of specificity, psychology, shark, sports psychology, sprinting, surfing, swim training, tricks of swimming trade, wave. Bookmark the permalink. That’s an amazing story, Gary. 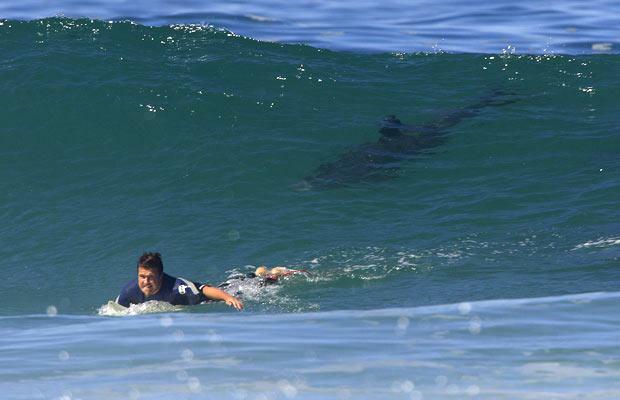 Did you head back out surfing after that? We also use the “swim like a shark is chasing you” motivation at practice, but a number of years ago we modified it. At the time we had a very nice but over aggressive senior swimmer who was helping us coach. She often frightened the little kids with her scary exhortations to swim faster. Our phrase then became, “Swim like a shark is chasing you, and Larissa is chasing the shark!” Seemed to work really well. The lifeguards sent out their boat and they found the spot where the huge net had come loose off the bottom, fixed it and the next day everyone was back in the water. We stayed out the rest of the day!